Since I am writing this as Halloween approaches, I decided to focus on a somewhat spooky and mysterious topic this month-- the manuscript entitled "A Memorable instance of Divine guidance and protection," a story in which two Quaker ministers find themselves in a situation eerily familiar to that of Hansel and Gretel. This manuscript was first brought to my attention back in June, when a visiting PhD student at the University of Missouri came across it while researching for a presentation she did at Haverford, entitled, "The Drama of Dissent: Pamphlet Culture and Performative Protestant Texts of the Long Eighteenth Century." I recently cataloged the manuscript, and it seemed a timely topic, given that I came across it in October, and it does have a certain creep factor. The story begins with a bit of background: at the ripe old age of eighty years, James Dickinson and Jane Fearon sit down to dictate their tale to their young friend, Sarah Taylor, who is at this time eighteen years old. James and Jane help each other along with the details, "the one assisting the other in recollecting the circumstances as they related them to her." 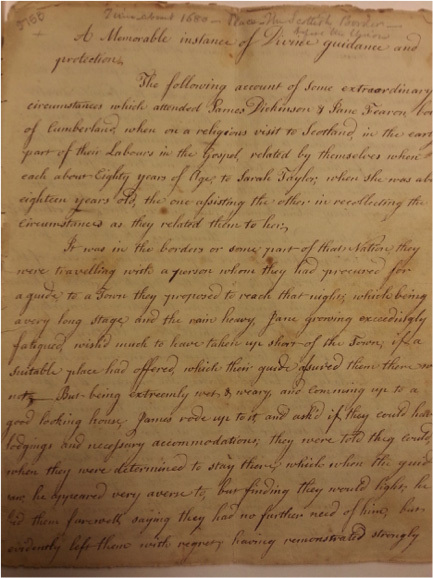 It is 1680, and James and Jane are traveling as Quaker missionaries in the "borders," the areas in and around the border between Scotland and Northern England. Now, both James and Jane, we are told, are from Cumberland, in Northern England. So, if not necessarily local, they would have been at least somewhat familiar with the area. It was, of course, a dark and stormy night, and James and Jane are still far from the next town, where they might seek shelter. Jane is exhausted, and she asks the guide who is accompanying them, if there might be anywhere they could spent the night nearby. The guide assures her there is not. At this very moment, the little party of travelers comes upon a house! Convenient, no? James rides up, and asks if they might stay for the night, and he is told that the woman of the house can accommodate them. When the guide discovers that James and Jane plan to stay at this house, we are told, "he appeared very averse to, but finding they would light, he bid them farewell, saying they had no further need of him, but evidently left them with regret, having remonstrated strongly their calling there at all." After their horses are taken care of, and their clothes hung to dry, the pair are given a cozy room, and "a cold meat pye was brought for their supper." It is at this point that Jane starts to feel like maybe somethingÍs not quite right in this house. As her apprehension grows, she confides to James that she "fully believed the pye was made of human flesh." James, despite his own apprehensions about their current predicament, dismisses Jane's fears, eating the pie and proclaiming it to be good. At this point, three men come into the house and James and Jane overhear them talking to the landlady, discussing the good horses and luggage the pair is traveling with. At this point, James is pretty sure he and Jane have made a terrible mistake, and he begins to pray for help to make their escape. After barricading themselves in their room, Jane proclaims she believed "they never should go alive out of the house." When they see through a crack in the wall that the woman of the house is sharpening a knife and turning to approach their room, they make their escape out of a back door. After being lead to safety by a divine "light" James and Jane go back to the house to fetch their horses and property, as you do after almost being killed by a cannibal. But, when they return, all of their things are safe and dry, and the only person in the house is a harmless little old lady sitting by the fire! Years later, on another religious visit to Scotland, James passes by the house, which now stands in ruins. In town, he inquires what became of the house and family who lived there, and is told that the family had long been suspected of murder, and some travelers who stopped there shortly after James and Jane escaped, went missing, after which the town arrested the inhabitants and demolished the house. A narrow escape for Jane and James, it seems! I was intrigued by the similarities of this story to that of Hansel and Gretel, and by the way this story predates the publication of the popular BrotherÍs Grimm version, so I did a bit of research. The Hansel and Gretel story most commonly known, is the version published by the Brother's Grimm in 1812-1813. It was later translated to English in 1826. Another popular version cited by folklorists and historians is that published by Charles Perrault in 1697, entitled "Le petit Poucet." While the Germanic version is the most widely known, there are versions of Hansel and Gretel-like stories all over the world! Like these popular iterations of the story, James and Jane's story shares the themes of abandonment and cannibalism. Abandoned by their guide, a figure of authority similar to the parents who abandon children in other versions of the story, James and Jane encounter a cannibalistic older woman who initially offers them food and shelter. While Hansel and Gretel find their way to safety using bread crumbs, James and Jane find their way to safety with a more celestial kind of bread crumb, "divine light." I had so much fun with this item„the Quaker and Special Collections are full of hidden treasures, and I love that I always get to discover something new!